Old carpet removal does not require special skills or tools. But, it does require patience and at least one set of helping hands to get it done. Depending on the condition and installation type, you might need more than two people to pull this job off. However, it the majority of cases, just a couple of people can do this in about a half hour. Although, that doesn’t account for the time and effort to dispose of it. Like many other types of construction materials, carpet and other types of flooring are usually on the approved pick up list for the local trash collection agency. These companies typically prohibit construction and remodeling debris. And, since carpet is now largely recyclable, it must go to the appropriate facility. Keep in mind, there’s also the padding to deal with. Furthermore, you might have to put some TLC into the subfloor underneath. 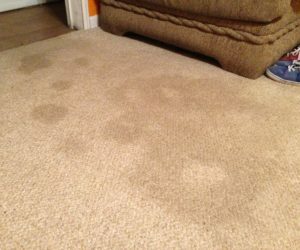 Since carpet is so porous, it’s common to find stains and other sorts of damage to the subfloor. Move any furniture out. Some people try to skip this step, thinking they can just move furniture around the room without having to actually relocate it to another area. This simply won’t work, so move all furniture out of the room. Take the base trim off the walls. Next, you’ll take the base trim around the walls off. You’ll just need a pry bar to do so. Exercise caution if you plan to reuse the trim again. Start pulling the carpet in one corner. When the room is empty and the trim is off the walls, then you can roll up the carpet by starting in a corner and working laterally to free one side. You can cut the carpet in half and make two rolls so it’s easier to manage. When you need carpet removal, go ahead and phone 800-433-1094 or visit Junk Garbage Removal.